T hey can give a marvellous opportunity to use bold colors in an abstract way to create unusual vibrancy. 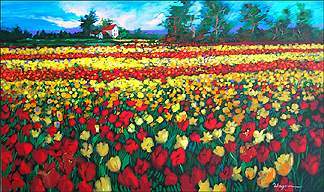 Rows of tulips advance into the distance creating rhythms of red, orange and yellow. Try to think about your painting as a design with abstract elements instead of a collection of items to be copied. Even the old masters had that as an underlying goal. Don't be afraid to take chances. Not every painting will be a success, but it can be a learning experience. Have fun! Don't be too serious. Creating art is play! Remember the fun you probably had as a child creating paintings. This quotation by Paul Cezanne is an inspiration to me to always keep in mind that God is the Master Designer and to let creation be the source of my landscape ideas.